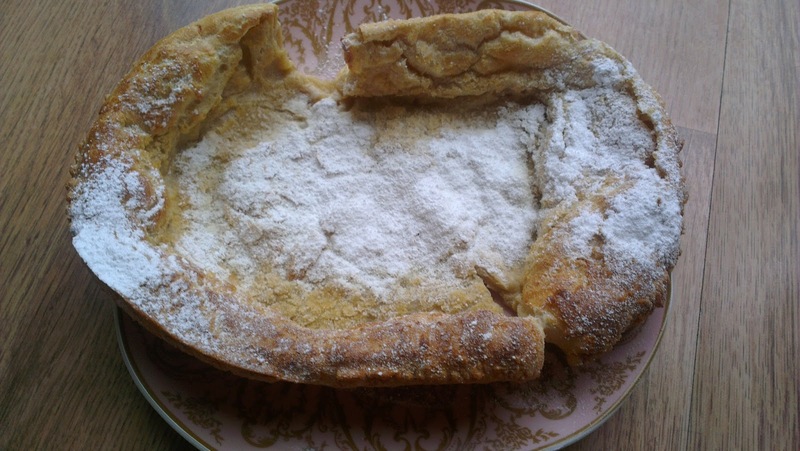 Has there been a more terrifying name for a recipe than "Dutch Baby"? I suppose "Bloody Mary" doesn't sound too tasty and "toad in the hole" is less than appetising. Rest assured that no babies were harmed in the making of this dish. It also has nothing to do with the Netherlands. It's basically a sweet Yorkshire pudding flavoured with vanilla and cinnamon, light and warm and filling. It makes for a perfect weekend breakfast, especially when it's cold outside. It's going to be cold til August, you know. Aslan is never going to come and bring the summer. So stock up on eggs, flour and milk and whatever you want to top it with - I went for icing sugar and a squeeze of lemon, but you could add maple syrup, fruit, jam, whatever takes your fancy. Preheat the oven to 220C/425F/gas mark 7. Put an ovenproof frying pan in to heat up (or a round baking tray with fairly deep sides if you don't have one). Whisk the eggs until light and fluffy, pour in the milk, then add the flour, vanilla, cinnamon and salt. Beat to a smooth batter. Take the hot pan out of the oven and add the butter, allowing it to melt and coat the inside. Pour in the batter and put it straight back in the oven. Bake for 12-15 minutes until puffed and golden. Serve immediately for maximum effect. I am half dutch ... I feel it is my duty to try this! It IS! Please try it and report back!